You're trying to be the first man in America to own an intercontinental railroad, and must hire workers, plan out your tracks, and contend with rival businessmen, to own the railways. Start out in the year 1804, as you put together the beginning of a long-lasting enterprise. As you forward in time you'll choose fromover 30 types of engine and dozens of cars, from the old days to the year 2000. As you progress you'll be challenged to keep the books balanced, the trains running on time, and the customers happy, and build a reputation of two hundred years of great service! Railroad Tycoon Deluxe utilizes a manual-based copy protection system. 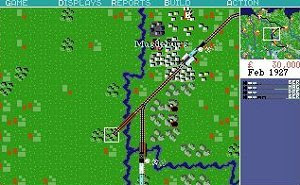 This was common back when Microprose first released Railroad Tycoon. The game asks the user a question, which can only be answered by checking the physical manual. For this release we have provided the complete Railroad Tycoon Deluxe manual in PDF format, as well as a quick reference sheet that has all the trains you'll need to answer the copy protection answer. We recommend that you print out this sheet and keep it handy when playing the game, or switch to windowed mode (if you're running full screen it's ALT+ENTER) and open the manual or reference sheet in another window. You will have to do this every time you run the game. You can find both PDF files in the manual folder in your install directory, and shortcuts to each were created in your start menu during the installation process.